BEFORE: I’ve filed Into the Abyss under the miscellaneous subchain of the documentaries as it doesn’t deal with the United States per se. It takes place in Texas and deals with the death penalty, but I have a feeling it will be taking a more thematic approach as opposed to focusing on laws in the U.S. specifically. Also of note: this is the second Werner Herzog film of this chain (and marathon), the first being Encounters at the End of the World. AFTER: Capital punishment is a very controversial issue with very ardent supporters and opponents. 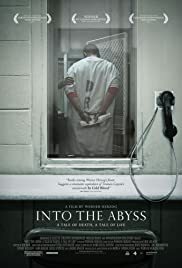 Into the Abyss looks very deeply into this issue and uncovers some shocking revelations from people on both sides of the topic. Very little of the documentary actually focuses on the trial; it really all comes down to what the victims and convicts feel and think about the events that occurred in October 2001. The beginning sets the viewer up and gives a brief overview of the timeline of events, but after that, the investigation fades away and the people take the spotlight. Watching this film really makes you think about how precious life is, even that of a convicted criminal. There are so many revelations, and those by Fred Allen, a former correctional officer who oversaw executions, really made an impact. Here is someone who, willingly, lead people to their death for years, but then one day, he couldn’t do it anymore; the job just took too much of an emotional toll on him. To see what someone like Fred Allen or many of the other interviewees have come to realize about life and death is really impactful because it’s something that these people deal with everyday.